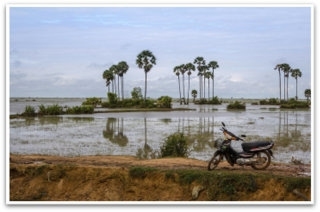 Situated in the tropics, Cambodia experiences a monsoonal climate with distinct wet and dry seasons. The wet season extends from May to October, while the dry season runs from November to April. Most rice-growing areas receive between 1,250 and 1,750 mm of rainfall annually. However, rainfall is extremely erratic and short-term droughts can occur during any of these months. Inadequate rains in May and June delay seedbed establishment and lead to poor land preparation. Inadequate rains in July and August delay transplanting, leading to poor transplant-recovery and poor vegetative growth. Reduced rains in October and early cessation of the monsoonal rains can adversely affect yield accumulation of the rice plant during its reproductive, flowering, and grain-filling stages for the intermediate and late-maturing groups. Data on rainfed lowland rice area affected by drought and flood. Since 1995, drought has affected rainfed lowland rice, up to about 20% in 1998. In 2004, drought affected more than 12%. In the last 17 years, drought has affected about 3% of the total rainfed lowland rice area, while flooding has affected an average of almost 6%. Some 285,240 hectares in Cambodia suffer from drought (Fig. 7). In terms of rice seedlings, tens of thousands of hectares of rice seedlings in the cities and provinces are affected. The country’s National Committee for Disaster Management reported that, as of August 2012, drought had damaged 11,350 hectares of rice seedlings in 14 cities and affected another 139,350 hectares in other provinces. Drought. Testing IRRI’s drought-tolerant genotypes in the dry season of 2012. Seeds of 51 genotypes received from Dr. Johnson and 15 from Dr. Brar were multiplied in the 2011 wet season at CARDI. An integrated management approach to help farmers harvest high yield was developed. This management approach, named SROV PHAL, is based on the Australian Rice Check Model.